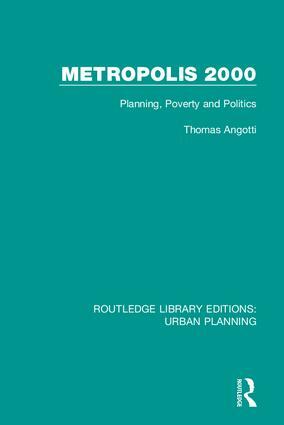 Originally published in 1993, Metropolis 2000 analyses 20th century metropolitan development and planning under the economic and environmental conditions of the world’s regions. Attempts to achieve the physical integration of the city without economic equality have failed. The book advances the principle of ‘integrated diversity’ which emphasises linking neighbourhood planning with a broader vision of the planned metropolis and applies a political economy approach, and argues for a new form of pro-urban thinking. The book argues that the basis for a humane approach to city planning is viewing the metropolis as a beneficial accompaniment to national independence, equality and social progress. The volumes in this set, originally published between 1970 and 1998, draw together research by leading academics in the area of urban planning, and provide a rigorous examination of related key issues. The volumes examine teaching, urban markets, planning, transport planning, poverty, politics, forecasting techniques and an examination of the inner city in Europe and the US, whilst also exploring the general principles and practices of planning. This set will be of particular interest to students of sociology, geography, planning and urbanization respectively.